Download "Zimmer Small Fragment Universal Locking System. 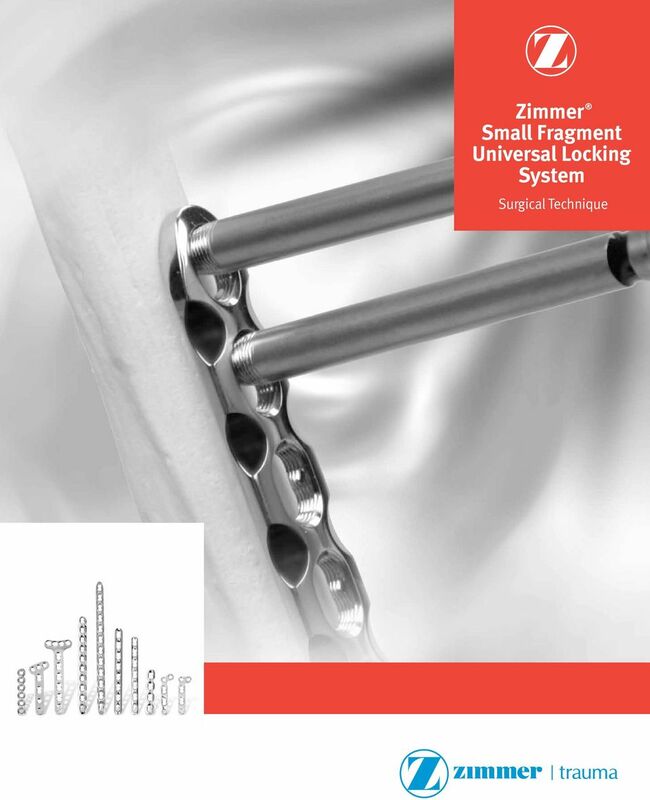 Surgical Technique"
4 2 Zimmer Small Fragment Universal Locking System Introduction The Zimmer Universal Locking System (ULS) includes straight and formed plates that will accommodate standard cortical and cancellous screws, along with locking screws that have threaded heads which enable them to be threaded into plate holes. The ULS plates resemble standard plates, but have figure-8 shaped holes which will accommodate standard or locking screws on either side of the hole. As a result, the plate can be used, depending upon the fracture situation, as a compression plate, a locked internal fixator or as an internal fixation system combining both techniques. 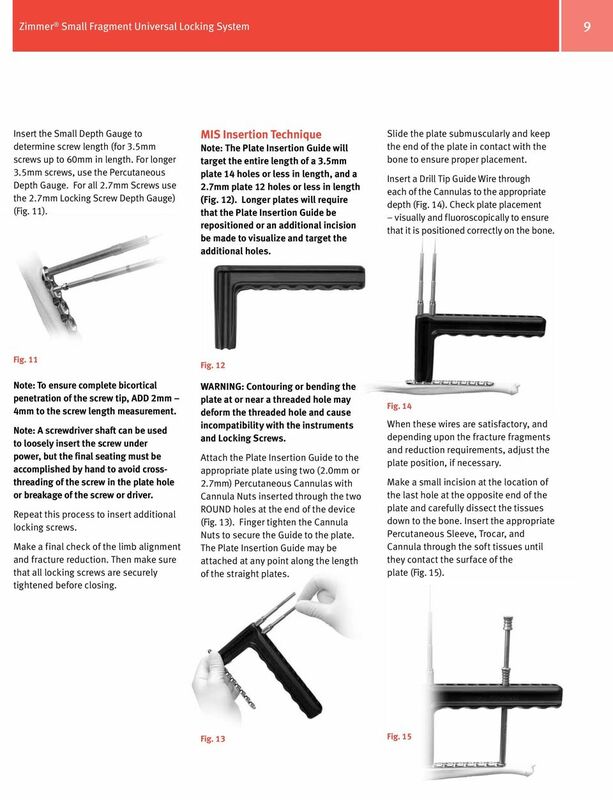 With a slightly different philosophy of use and modified surgical techniques, these plates provide more fixation options and, often, better fixation in many difficult fractures. Outer jellybean provides dual compression capability The Zimmer Universal Locking System enables the surgeon to: Treat fractures using compression plating techniques with standard cortical or cancellous screws Apply the implant as an internal fixator to bridge highly comminuted zones while providing stable fixation Utilize both standard and locking screws in the same construct Apply bi-directional axial compression within the construct Place the plate on the bone based on the fracture pattern or type, rather than on the plate design Apply the plate submuscularly, with or without a guide Utilize unicortical locking fixation as necessary Utilize existing Periarticular Locking screws and instrumentation, and Zimmer Plates and Screws screws and instrumentation. 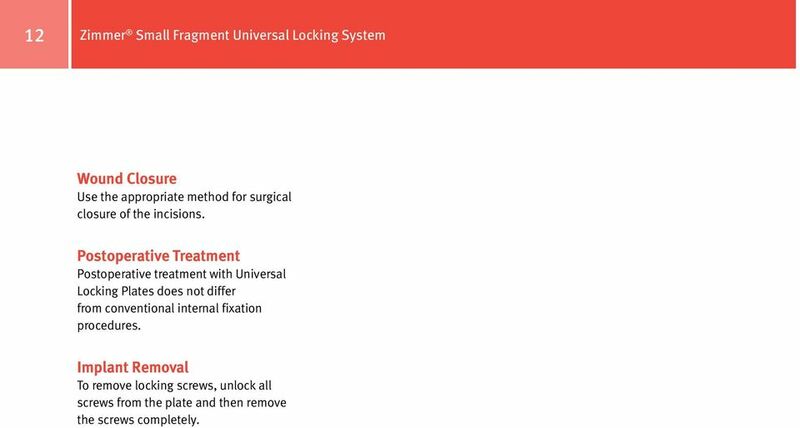 Note: The Universal Locking System includes many different plate types and can be utilized for treatment of a large number of fracture types. As a result, this surgical technique does not deal with any specific fracture type. Inner figure-8 threaded portion provides locking capability at either end of the hole Please refer to standard orthopaedic texts, the OTA, and other special literature for more specific fracture treatment options. 5 Zimmer Small Fragment Universal Locking System 3 Indications for Use The Universal Locking Plate System is indicated for temporary internal fixation and stabilization of osteotomies and fractures, including: Comminuted fractures Supracondylar fractures Extra-articular fractures Fractures in osteopenic bone Nonunions Malunions The Zimmer 3.5mm Universal Locking System includes: 3.5mm Locking Dual Compression Plates Locking One-Third Tubular Plates 3.5mm Locking Reconstruction Plates 3.5mm Locking T-Plates 3.5mm Oblique Locking T-Plates 3.5mm Locking Screws 3.5mm Cortical Screws 4.0mm Cancellous Screws The Zimmer 2.7mm Universal Locking System includes: 2.7mm Locking Dual Compression Plates Locking One-Quarter Tubular Plates 2.7mm Locking Reconstruction Plates 2.7mm Locking T-Plates 2.7mm Locking L-Plates 2.7mm Oblique Locking L-Plates 2.7mm Locking Screws 2.7mm Cortical Screws Plate Features 80 of longitudinal screw angulation 14 of transverse screw angulation Uniform hole spacing along the length of the plate Load/compression and neutral screw positions The Universal Locking Plates have combination locking and compression holes creating a figure-8 shaped plate hole. The ULS hole allows placement of standard cortical screws, cancellous screws or locking screws on either side of each hole. 3.7mm 2.9mm 3.5mm Hole 2.7mm Hole Available in stainless steel and Ti-6AL-4V Titanium Alloy or CP Titanium (Based on Plate Style). 6 4 Zimmer Small Fragment Universal Locking System Locking Screw Features Double-lead threads (Double the shaft thread pitch) Shallow thread profile compared to traditional screws Self-Tapping Head and shaft advance at same rate into plate and bone 3.5mm Locking Screw 2.7mm Locking Screw The locking plate design does not require compression between the plate and bone to accommodate loading. Therefore, purchase of the screw in the bone can be achieved with a thread profile that is shallower than that of traditional screws. The shallow thread profile, in turn, allows for screws with a large core diameter to accommodate loading with improved bending and shear strength. Screw head is designed to create nearly flush profile on the plate to decrease soft tissue irritation All screws are self-tapping to aid ease of insertion Double-lead screw head thread is double the screw shaft thread pitch. Screws will advance at same rate into the plate and as into the bone. Double-lead thread allows for maximum thread capture in thin plate sections Screws are machined from cold worked stainless steel for improved fatigue strength as compared to conventional cold worked 316L stainless steel, and from Ti-6AL-4V Titanium Alloy, Type II Anodized. Screw lengths sized for uni-cortical as well as bi-cortical screw fixation. 8 6 Zimmer Small Fragment Universal Locking System Surgical Technique Required instrumentation 3.5mm Zimmer Universal Locking System Set or 2.7mm Zimmer Universal Locking System Set In addition, the following sets may be used: 3.0mm Zimmer Cannulated Screw Set 3.5mm/4.0mm Zimmer Cannulated Screw Set Herbert or Herbert/Whipple Screw Sets Preoperative Preparation After assessing the fracture radiographically and preparing a preoperative plan, place the patient in the appropriate position on a radiolucent table. Be sure that the fluoroscope can be positioned to visualize the fracture in the both the lateral and anterior/posterior (A/P) views. 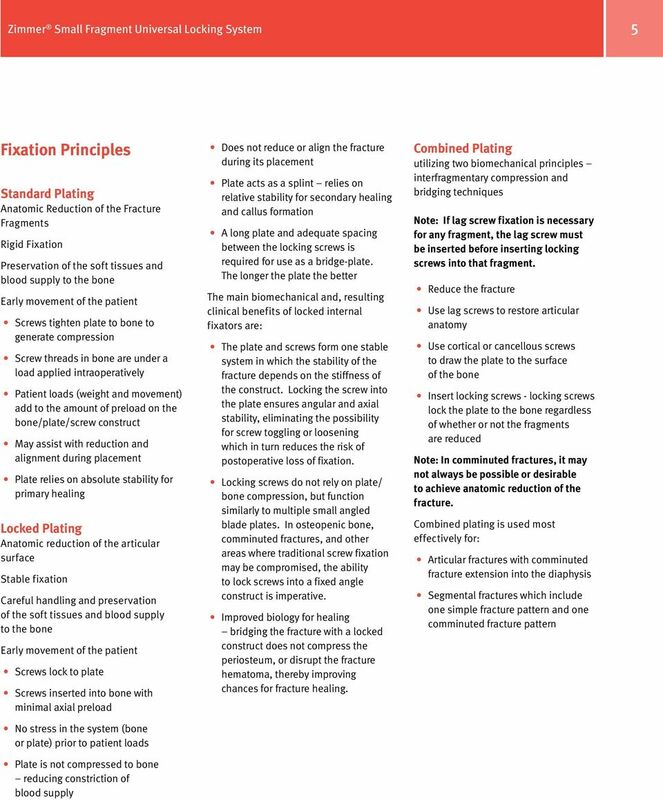 Fracture Reduction It is imperative that accurate reduction of any articular fracture be obtained prior to and maintained during application of the Universal Locking plates. Plate Selection The plates are available in a variety of lengths and sizes similar to the Zimmer Small Fragment System. 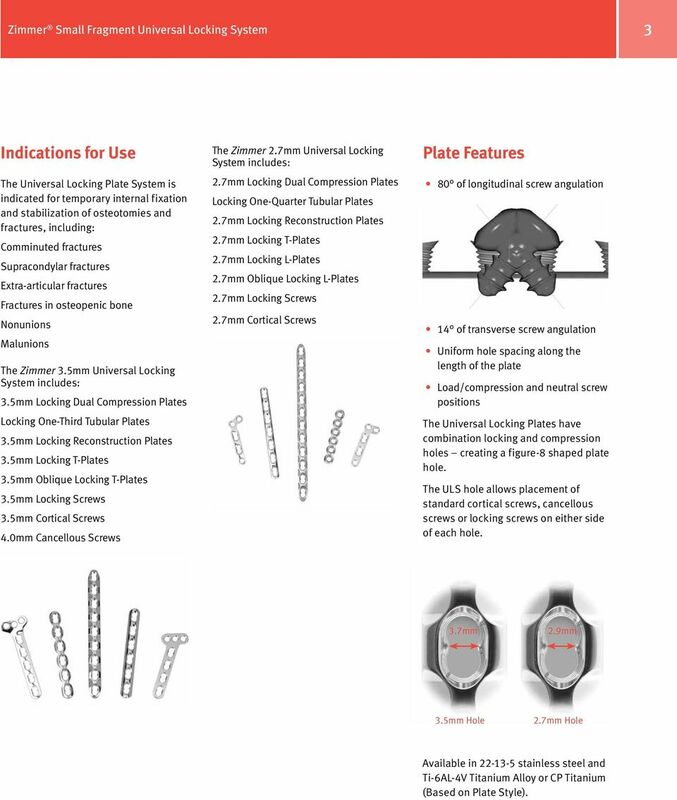 If necessary, x-ray templates are available to help determine plate length and configuration. Plate Positioning One or more Cannulas may be threaded into the plate for use as an insertion handle or plate positioning handle (Fig. 1). Fig. 1 Standard Plate Holding Forceps or the Plate Reduction Instrument may be used for temporary plate fixation. The Plate Reduction Instrument is designed to aid in minor varus-valgus and translation corrections prior to screw placement (Fig. 2). Fig. 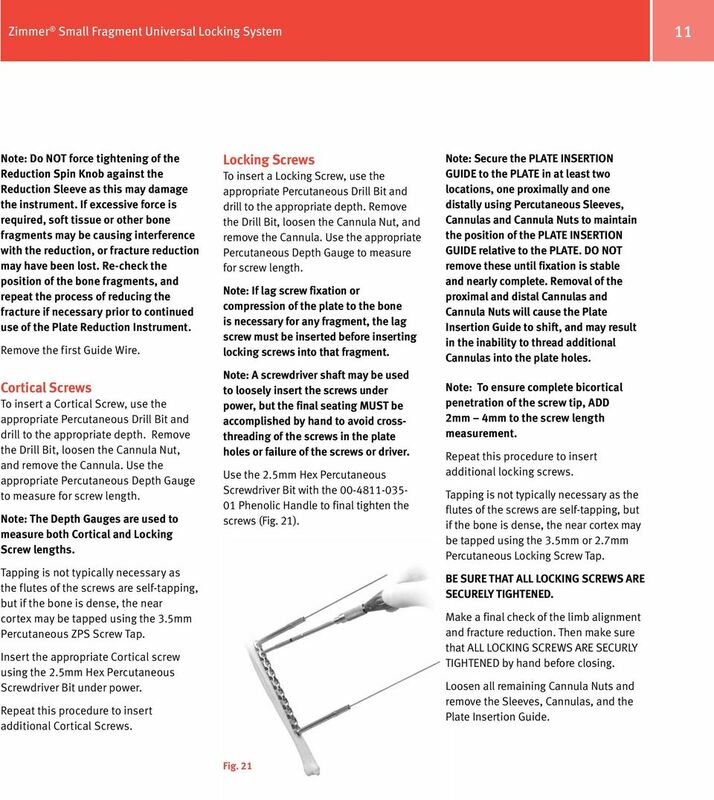 2 The Plate Reduction Instrument can be used for: MINOR varus-valgus adjustment (<5 ) Translational adjustments Stabilization of plate orientation with respect to the bone during insertion of the first screws MINOR alignment of segmental fragments To use the Plate Reduction Instrument, make a stab incision at the desired location. Insert the Percutaneous Sleeve and Trocar through the Jig and soft tissues ensuring that contact is made with the surface of the plate. Remove the Trocar. Pass the Reduction Spin Knob over the distal portion of the Plate Reduction Instrument until it engages with the fine threads approximately halfway up the shaft of the instrument. Spin the knob until it is positioned close to the quick connect end of the instrument. Insert the Plate Reduction Sleeve through the Percutaneous Sleeve and thread it into the plate. Next insert the Reduction Instrument through the Reduction Sleeve and into the bone fragment by hand or under power to the appropriate depth. Rotating the Spin Knob clockwise will cause it to contact the top of the Reduction Sleeve and in turn, draw the plate and bone together. Monitor progress using C-Arm images. Stop when desired reduction is achieved. Note: Do NOT force tightening of the Reduction Spin Knob against the Reduction Sleeve as this may damage the instrument. If excessive force is required, soft tissue or other bone fragments may be causing interference with the reduction, or fracture reduction may have been lost. Re-check the position of the bone fragments, and repeat the process of reducing the fracture if necessary prior to continued use of the Plate Reduction Instrument. WARNING: Contouring or bending the plate at a threaded hole may deform the threaded hole and cause incompatibility with the Locking Screw in that hole. 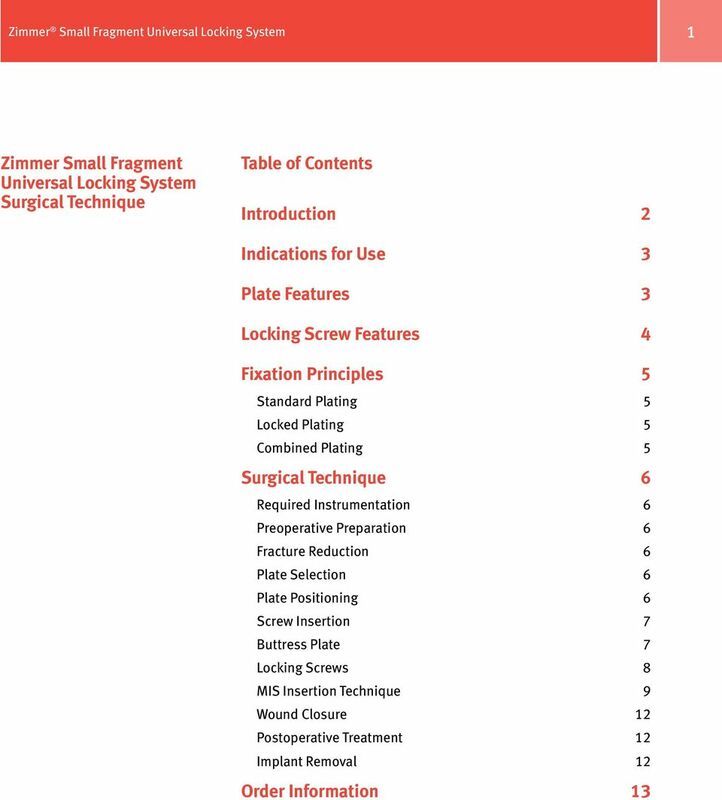 9 Zimmer Small Fragment Universal Locking System 7 Screw Insertion Determine whether standard Cortical, Cancellous, or Locking Screws will be used. Any combination of screws may be used. 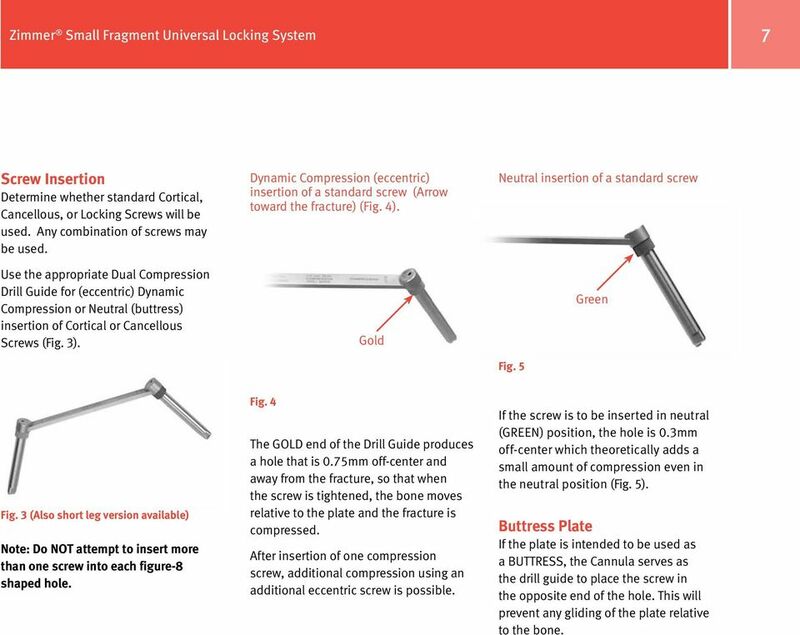 Use the appropriate Dual Compression Drill Guide for (eccentric) Dynamic Compression or Neutral (buttress) insertion of Cortical or Cancellous Screws (Fig. 3). Dynamic Compression (eccentric) insertion of a standard screw (Arrow toward the fracture) (Fig. 4). Gold Neutral insertion of a standard screw Fig. 5 Green Fig. 3 (Also short leg version available) Note: Do NOT attempt to insert more than one screw into each figure-8 shaped hole. Fig. 4 The GOLD end of the Drill Guide produces a hole that is 0.75mm off-center and away from the fracture, so that when the screw is tightened, the bone moves relative to the plate and the fracture is compressed. After insertion of one compression screw, additional compression using an additional eccentric screw is possible. If the screw is to be inserted in neutral (GREEN) position, the hole is 0.3mm off-center which theoretically adds a small amount of compression even in the neutral position (Fig. 5). Buttress Plate If the plate is intended to be used as a BUTTRESS, the Cannula serves as the drill guide to place the screw in the opposite end of the hole. This will prevent any gliding of the plate relative to the bone. 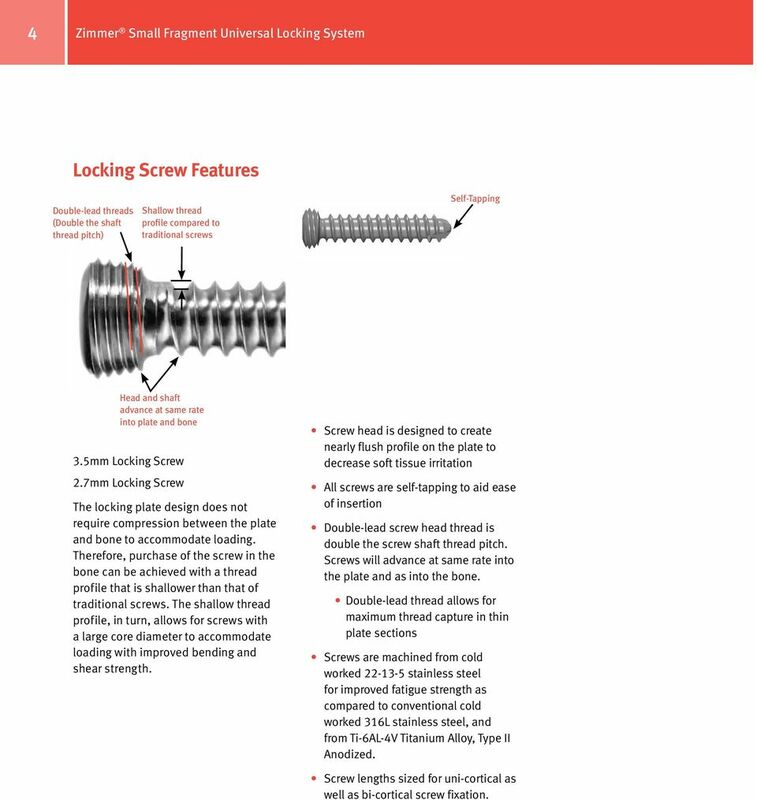 10 8 Zimmer Small Fragment Universal Locking System Locking Screws Note: If lag screw fixation or compression of the plate to the bone is necessary for any fragment, the lag screw must be inserted before inserting locking screws into that fragment. Insert the Drill Bit through the Cannula and drill to the appropriate depth. Remove the Drill Bit and the Cannula (Fig. 9 & 10). 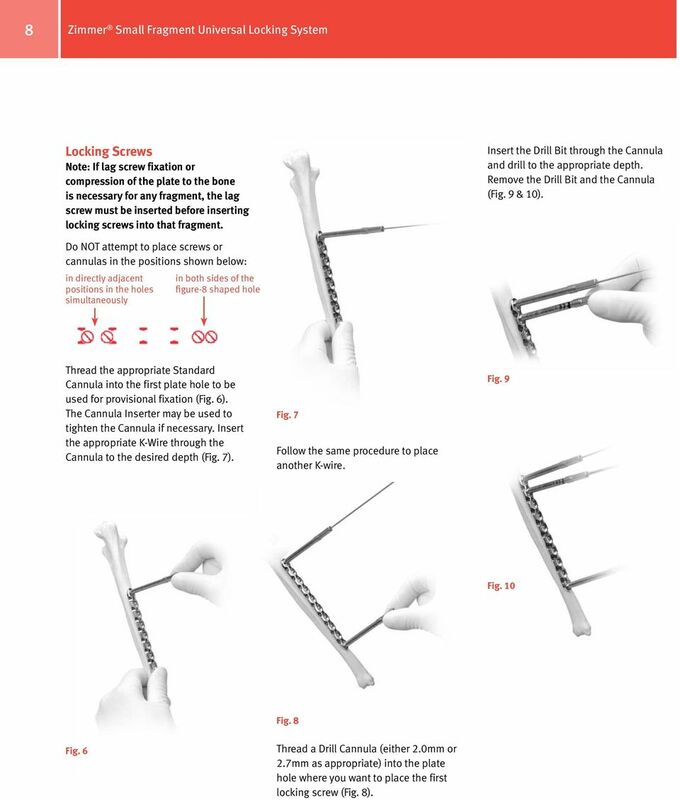 Do NOT attempt to place screws or cannulas in the positions shown below: in directly adjacent positions in the holes simultaneously in both sides of the figure-8 shaped hole Thread the appropriate Standard Cannula into the first plate hole to be used for provisional fixation (Fig. 6). The Cannula Inserter may be used to tighten the Cannula if necessary. Insert the appropriate K-Wire through the Cannula to the desired depth (Fig. 7). Fig. 7 Follow the same procedure to place another K-wire. Fig. 9 Fig. 10 Fig. 8 Fig. 6 Thread a Drill Cannula (either 2.0mm or 2.7mm as appropriate) into the plate hole where you want to place the first locking screw (Fig. 8). 12 10 Zimmer Small Fragment Universal Locking System Remove the Trocar and thread the 2.7mm or 2.0mm Percutaneous Cannula into the appropriate position in the plate hole. Finger tighten the Cannula Nut (Fig. 16 & 17). Insert a Guide Wire through the Cannula to the appropriate depth. Check plate position. The Plate Reduction Instrument (Fig. 18) can be used for: MINOR varus-valgus adjustment (<5 ) Translational adjustments Stabilization of plate orientation with respect to the bone during insertion of the first screws MINOR alignment of segmental fragments To use the Plate Reduction Instrument, make a stab incision at the desired location. 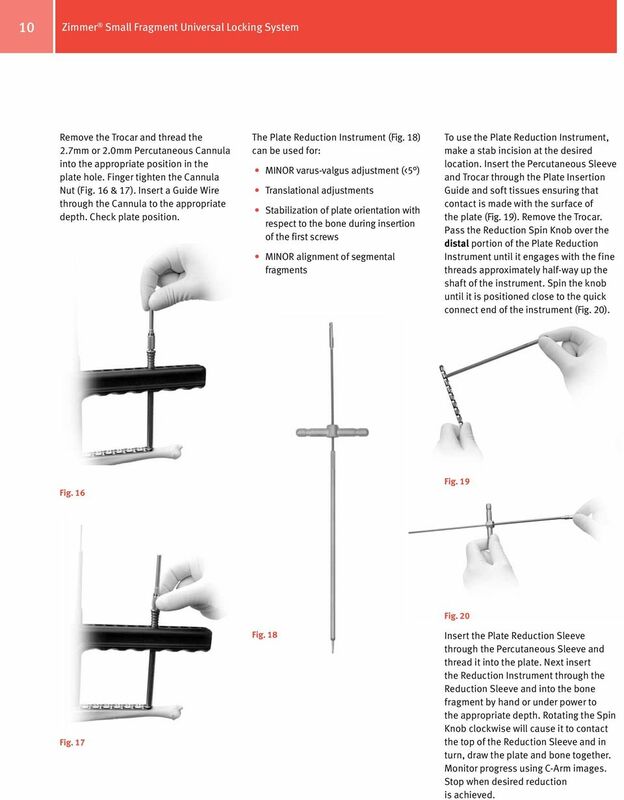 Insert the Percutaneous Sleeve and Trocar through the Plate Insertion Guide and soft tissues ensuring that contact is made with the surface of the plate (Fig. 19). Remove the Trocar. Pass the Reduction Spin Knob over the distal portion of the Plate Reduction Instrument until it engages with the fine threads approximately half-way up the shaft of the instrument. Spin the knob until it is positioned close to the quick connect end of the instrument (Fig. 20). Fig. 16 Fig. 19 Fig. 17 Fig. 18 Fig. 20 Insert the Plate Reduction Sleeve through the Percutaneous Sleeve and thread it into the plate. Next insert the Reduction Instrument through the Reduction Sleeve and into the bone fragment by hand or under power to the appropriate depth. Rotating the Spin Knob clockwise will cause it to contact the top of the Reduction Sleeve and in turn, draw the plate and bone together. Monitor progress using C-Arm images. Stop when desired reduction is achieved. 14 12 Zimmer Small Fragment Universal Locking System Wound Closure Use the appropriate method for surgical closure of the incisions. Postoperative Treatment Postoperative treatment with Universal Locking Plates does not differ from conventional internal fixation procedures. Implant Removal To remove locking screws, unlock all screws from the plate and then remove the screws completely. 16 Please refer to package insert for complete product information, including contraindications, warnings, precautions, and adverse effects. Contact your Zimmer representative or visit us at The CE mark is valid only if it is also printed on the product label. +H /$100518R3E10U Rev T21 3ML Printed in USA 2006, 2009, 2010 Zimmer, Inc.
Small Fragment System. Instruments and implants for 2.7 and 3.5 plate fixation. 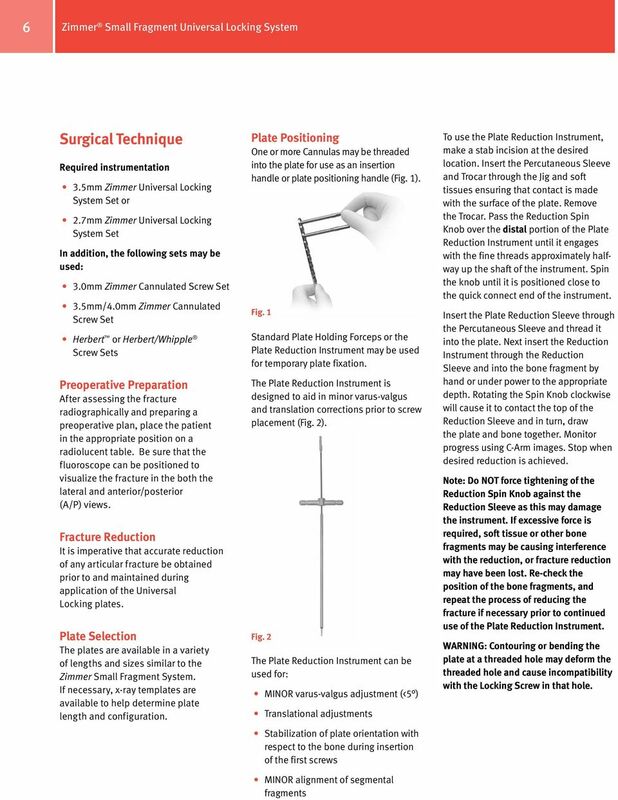 SURGICAL TECHNIQUE STEP BY STEP Hand 1.2-2.3 APTUS Hand 2 Hand 1.2-2.3 LITERATURE 1. Ruchelsmann, D.E., Chaitanya, S.M., and Jupiter, J.B. The Role of Locking Technology in the Hand Hand Clinics 26, 307-319. Technique Guide. 2.4 mm LCP Distal Radius System. 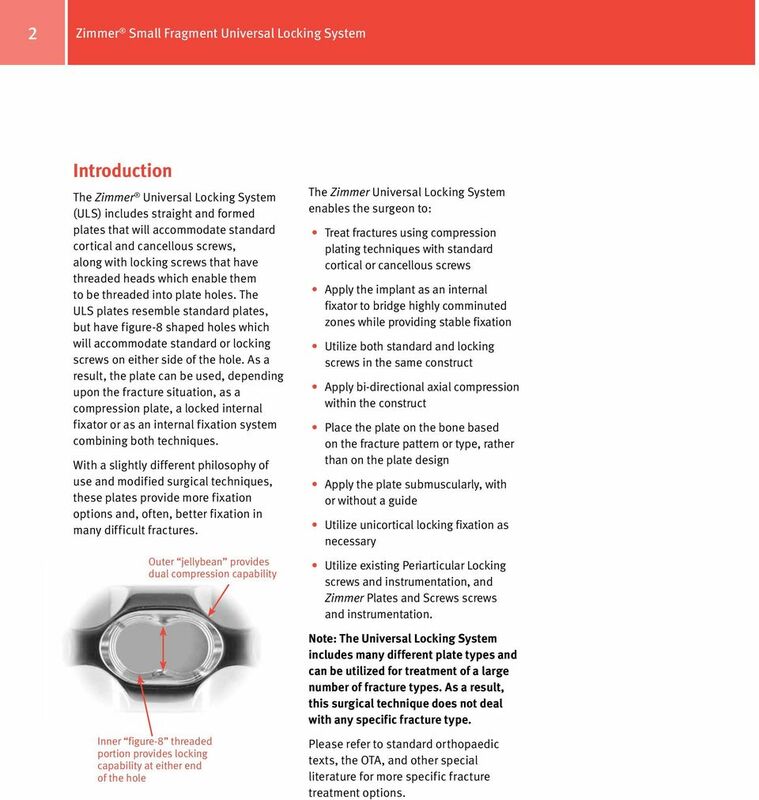 A comprehensive plating system to address a variety of fracture patterns. LCP Superior Clavicle Plate. The anatomically precontoured fixation system with angular stability for clavicle shaft and lateral clavicle. MatrixNEURO CMF Matrix This publication is not intended for distribution in the USA. MatrixNEURO Introduction The aim of surgical fracture treatment is to reconstruct the bony anatomy and restore its function. Modular Sternal Cable System. Flexibility and strength in sternal closure and repair.